For more than 20 years now, the Appalachian Long Distance Hikers Association has led the way on hiker behavior on the trail. Hiker services are always just one bad bunch of backpackers away from being boarded up for good, denying their services and other conveniences to all future hikers forever. The so-called Endangered Services Campaign seeks to spur peer pressure among thru-hikers to get everyone on the same page. Because that's all there is out there on the trail -- other hikers to monitor and mend the negative actions of the few. And it works in trail towns, too, where hikers still have to share the same basic services: hostels, hotels, laundromats, restaurants. If you see something, say something, DO something. Recently we've seen other damage caused by a handful of inconsiderate hikers, those who think they can pull one over on park authorities by pretending their dog is a service animal. Wow, that's like a nonveteran pretending to be a war hero by wearing fake medals or telling people he served in combat, or someone stealing the hard-won efforts of the handicapped just so he can cheat the system and park closer to a store, or get his dog to go with him up to the summit of Katahdin. Being stupid like that doesn't qualify you for handicapped status. There's no excuse for it. The result of such lame acts? You could be the one who causes Mount Katahdin to be closed to the Appalachian Trail for eternity. Yes, it's that serious. If you and your like-minded long-distance hikers don't speak up, no one else will, and by then it will be too late. The ALDHA campaign includes posters, bumper stickers and now T-shirts. The subject is regularly discussed in workshops at every ALDHA Gathering. And the ALDHA Yahoo Group for service providers, where hostel owners and others can warn each other of possible pending issues through a closed, invitation-only Internet forum, is a direct offshoot of the Endangered Services Campaign. ALDHA continues to seek ways to get this message across, including this web page. Members of ALDHA are right now serving on a task force to address severe hiker issues at Baxter State Park in Maine, all thanks to a few bad apples. So please do your part on the trail and in trail towns. 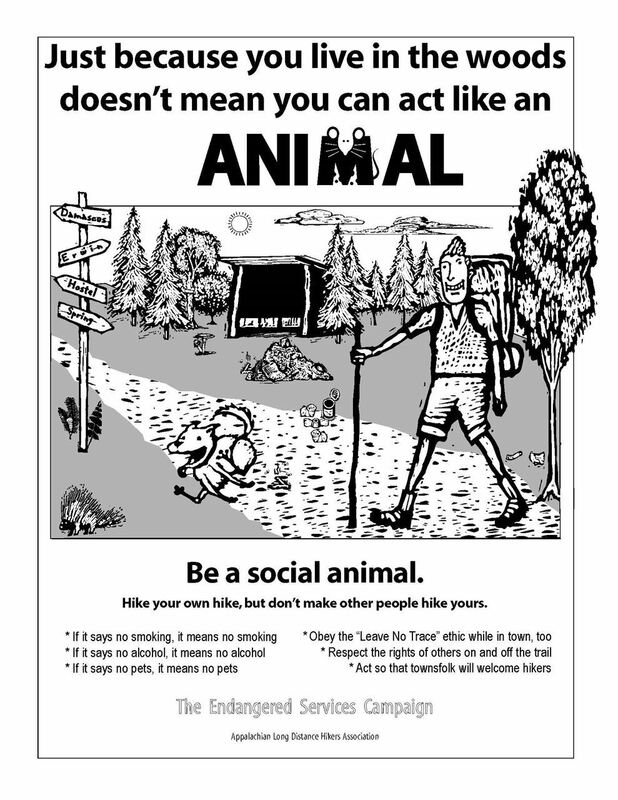 Speak out when you see poor hiker behavior. It's the right thing to do. P.S. If you have any questions about the program, contact the ALDHA coordinator at coordinator@aldha.org. The following story appeared in the winter '95-96 issue of The Long Distance Hiker, explaining ALDHA's Endangered Services Campaign, as illustrated by the copy of our original campaign poster, below. As responsible members of the hiking community, ALDHA has been taking a fresh look at the issue of backpacker behavior for the past year and a half. In 1990, ALDHA put together a list of guidelines for hikers to follow when staying in hostels, but year after year, as more and more people take to the A.T., more and more problems arise in towns where public perception of the hiking community is vital to the very existence of the Appalachian Trail. At the 1994 Gathering in Hanover, N.H., a workshop on this very subject filled a room to capacity. Ron Keal, then coordinator, appointed a group to look into the subject and report back at the 1995 Gathering. There were loads of concerns from all perspectives. On one hand, many people do a thru-hike for the express purpose of trying to get away from society and all its rules. On the other hand, people who provide services to these hikers have been getting burned, abused and downright ripped off by that small percentage of hikers who ruin it for others by their behavior. How do we address that without destroying the "Thoreauian spirit" of the trail? Are we our brother's and sister's keeper, even in the woods? Some folks quoted popular phrases, others went right to Scriptures. "Treat others the way you'd want them to treat you," we heard. But also heard frequently by all of us: "Hike your own hike, man." Or: "Get off my back, I've already got a pack." Let's face it. Without public support there would be no trail. Agreements with private landowners, arrangements with local, state and federal government agencies, compacts with the public over the stewardship role we all play when we lace up those boots . . . all of that will evaporate if the public continues to become disgusted with our worst behavior. The trail will wither and vanish without public backing. 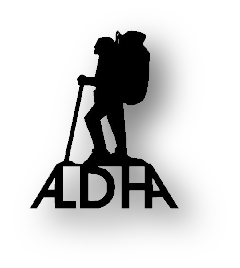 And without the trail there will be no long-distance hiking community called ALDHA. It's simply that simple. Something needs to be done. So, taking a positive approach, with perhaps a little humor, we dubbed our efforts the Endangered Services Campaign. Just as some plants and animals along the trail are endangered, so, too, are some hiker services. Already we've lost the pavilion at Shea's Pine Tree Tavern in Sheffield, Mass., and the O'Lystery Community Pavilion in Ceres, Va. Some businesses no longer welcome us, and some hostels are reconsidering staying open. We've even heard horror stories about thru-hikers kicking other people out of shelters because they believed -- incredibly -- that somehow they were entitled to shelter space solely by virtue of being thru-hikers. All of these incidents show hiker disrespect for the rights of property owners and other hikers. Present trends will continue to take their toll unless we begin to act responsibly. At the Pipestem Gathering in the fall of '95, we set aside a block of time with nothing else scheduled except a groupwide discussion on what we came up with. Many of you had excellent suggestions, some of you complimented us on what we developed. Others were rather skeptical. So, with a little fine-tuning based on those comments, we've come up with a poster (reprinted here, in reduced form) to help get our message out. For starters, we're in the process of getting these notices posted at hostels and some businesses that have complained in the past about certain hikers' behavior. We've also asked the Appalachian Trail Conference to include a copy in the packets they send people who are planning thru-hikes. Our hope is that hikers will eventually adapt the "Leave No Trace" camping ethic to their activities in towns, not just to their behavior in the woods, and do it without even thinking twice about it. Just as you wouldn't leave behind a burning campfire, so, too, you wouldn't want to leave a hostel in ruins because you didn't think that "no smoking" sign applied to you. Or, more importantly, this endeavor will encourage you to speak out when you see someone else threatening yet another endangered service on the trail. 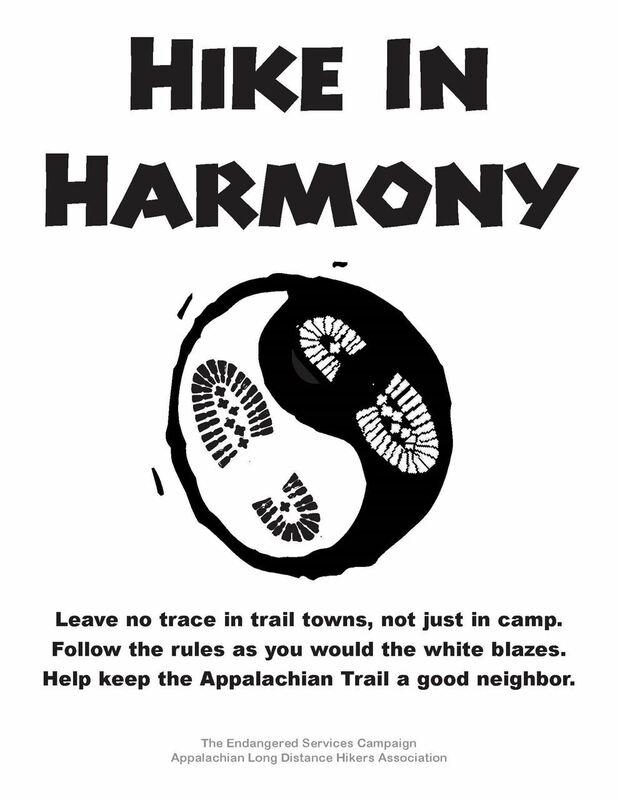 The yin and yang symbol, adapted here to apply to hikers, has long been a symbol of harmony, taking divergent and oftentimes opposing elements to create a unified whole. We would share the seven official Leave No Trace principles in this space but they are copyrighted. You can view them on the LNT website if you want. Instead, here are the basic ethics rules for backpacker behavior on the A.T., and there are really only 3, as seen on the ALDHA poster at left. Leave no trace in trail towns, not just in camp. Follow the rules as you would the white blazes. 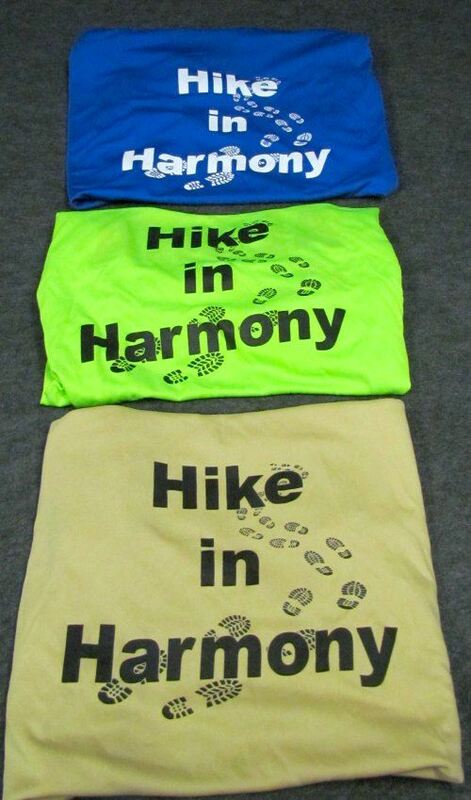 Help keep the Appalachian Trail a good neighbor. That's it: Feel free to copy and paste it to your heart's content! In fact, click on either poster to get a hi-rez PDF that you can print and post in a prominent location but, DON'T put it in shelters, registers, or anywhere else on the trail itself.